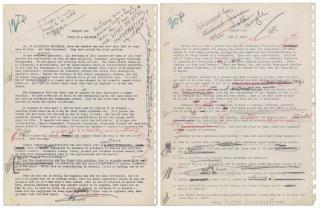 (Newser) – The founding document of Alcoholics Anonymous, known to adherents as the "Big Book," is heading back to auction after a lawsuit disputing its ownership was settled. Auction house Profiles in History announced Wednesday that the manuscript and manifesto is going up for auction on May 5 in Los Angeles. It is expected to fetch between $2 million and $3 million, the AP reports. The 161-page typed document with yellowing pages, considered to be nearly scripture by some AA followers, gives the first outline of the group's 12-step recovery program. It is filled with handwritten notes and scribbles from the founding fathers of AA, including William Wilson, more commonly known as "Bill W." It had been slated to be auctioned last June, but Alcoholics Anonymous World Services, Inc. disputed Alabama resident Ken Roberts' rights to it. Roberts bought the manuscript at auction in 2007 for $850,000. Details of the settlement were not released, but Profiles in History said Alcoholics Anonymous had waived its rights to the manuscript. Wilson's widow Lois owned the papers after his death in 1971, and she passed them on to her friend Barry Leach. Alcoholics Anonymous said Leach signed and notarized a letter in 1979 saying the manuscript would belong to the organization after his death. He died in 1985, but the manuscript did not make its way to Alcoholics Anonymous, which did not know about the notarized letter at the time. Its ownership history in the ensuing years is not entirely clear until 2004, when Sotheby's auctioned it for $1.57 million. Then it sold to Roberts in 2007. A web page devoted to the auction describes the manuscript as a "Bible to millions" that has sold 30 million copies since 1939, been translated into 43 languages, and has been ranked by the Library of Congress as a top non-fiction book that shaped America. This belongs in a museum, not auctioned off to the highest bidder. Give up liquor and replace it with God. Which is worse? What's sad is that the modern AA ignores the fact that Bill Watson came to sobriety because of an LSD experience.